Project: Large subduction zone earthquakes, like the one that caused the 2011 Japanese tsunami, have historically occurred in the Pacific Northwest an average of every 300 years. The last one to occur happened in 1700. The Oregon Department of Geology conducted a multi-year project to map the potential tsunami hazard that these local subduction zone events, and distant earthquakes, pose to communities on the Oregon Coast. In the early phase of the project, tsunami scenarios were modeled by researchers using lidar-derived topography data. These modeled results were converted to GIS data and standardized for eventual use in DOGAMI’s tsunami inundation maps and tsunami evacuation maps. 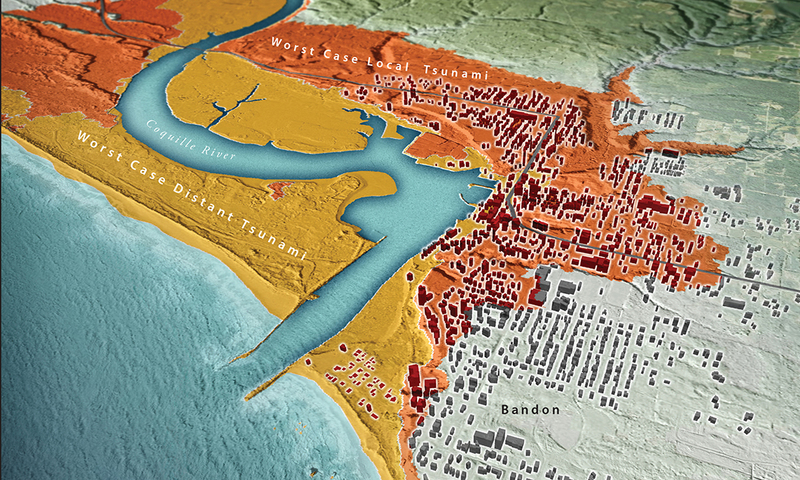 The image above of Bandon, Oregon, shows the modeled worst-case local and distant tsunami scenarios.